In some people, they evoke open-mouthed jealousy; in others, sheer revulsion. But however you feel when you see the vast, smug hull of a luxury yacht, we probably all have the same thought: who on earth owns that? It’s actually very easy to find out. Online ownership databases for super, mega and giga-yachts – loosely defined as privately-owned and professionally-crewed yachts that are more than 37m, 60m and 100m in length, respectively – are not only entirely searchable by name, but most of the world’s 4,000-plus are tracked, by amateur enthusiasts and satellites, and free to spy on whenever you like. So let’s. After two minutes on Superyachtfan.com and Vesselfinder.com, I can tell you that Kismet, the 91m mega-yacht on which Beyonce, Jay-Z and their children were photographed last week, is now safely moored near Pompeii. Kismet is owned by Shahid Khan, the Pakistani-American billionaire who also owns Fulham FC, as well as launching a recent £800m bid for Wembley Stadium. He rents the boat out for £1.1m per week – which, having earned a combined £112m just last year, the Carters can just about afford. Roman Abramovich’s 163m gigayacht Eclipse, meanwhile, is currently nestled off Antibes, a curiously long way from Bermuda, where it’s registered. I can find Sir James Dyson’s 91m Nahlin, one of the last three steam yachts built in the UK, off the Greek island of Poliegos. And the longest luxury yacht in the world – the $400m, 180m Azzam – was last spotted in the Gulf, near its owner, the Emir of Abu Dhabi. What isn’t searchable, however, is just how it feels to be one of those owners. Good, I imagine? Malouf – an Australian businessman who started as a bin-lorry driver 35 years ago, before building a fortune with his own waste management company – bought Mischief for £22.5m in 2015. A few months later he made headlines in the UK for cruising up the Thames and parking her in West India Dock during the Rugby World Cup. We are speaking via Skype, since he is just off Malta, where he dropped anchor recently (I see he’s now near Mykonos). Looked after by on-board management and chartered for much of the year, almost always in Europe, Malouf picked her up in the Med earlier this summer for a family pootle. Appearing on screen in a black t-shirt, the 53-year-old sounds exactly like the Bruce, the baritone shark from Finding Nemo, which is to say both affable and terrifying. Behind him, people in swimwear walk – some crew, some his five children, aged between 22 and 15 – cross back and forth. 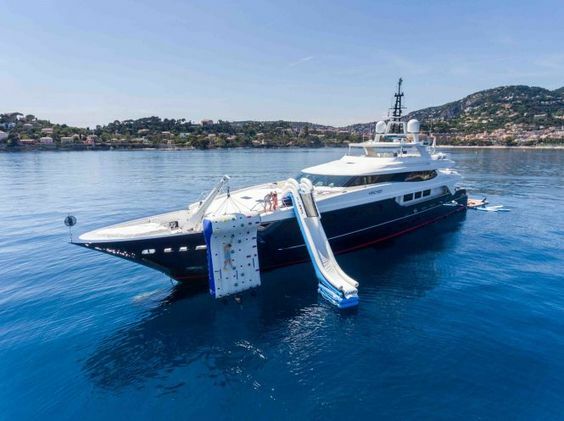 Mischief is not even close to the top 100 luxury yachts in the world by size, but she still has six cabins, takes 12 guests, contains a jacuzzi, a sun-lounging deck, a full bar, several dining salons, room for 14 crew (including two chefs), four Sea-Doos, a jet boat, gym equipment and – because why not? – the ability to convert into a silent disco. Aren’t you just constantly jealous of other rich men [there is one woman owner in the top 50 longest yachts list] with bigger boats, I ask? It must be gutting to pull up next to Eclipse, which features an armour-plated master suite, two swimming pools, two helipads, a cinema, a mini-submarine and its own missile defence system. He laughs. Of course, those other boats often contain the likes of Abramovich or Philip Green. Normal people must assume that because you have a superyacht you’re of... how to say this politely... similar moral standing? Malouf’s so passionate about this that he launched a company, Ahoy Club, which offers luxury yachts for charter; a kind of Uber for the mega-wealthy on water, if you will. Sick of the ironclad grip a cosy cartel of brokers have on the £10.6bn industry, who typically charge 20 per cent commission on all rents, it’s a website and app allowing prospective clients to charter in minutes, and pay substantially less. Mischief, for instance, was nearly £300,000 per week last year; with Ahoy Club it’s nearer £250,000. A snip, a real snip. Opening the app, Ahoy Club members can choose from more than 2,000 yachts. They then pick dates, be it an afternoon or a year, pay, and once they’ve gone to meet the yacht in their chosen pick-up spot, there’s 24/7 chat support available from experts in an office in London. Owners get a better deal as well, since they keep control of pricing, scheduling and ‘yacht rules’. So actually it's more like Air BnB. “Our intention is to make the market bigger, and more transparent, and it’s been really well received,” Malouf says. It’s easy to be enviously dismissive – and I am, I absolutely am – but he has a point. For people who can afford to pay hundreds of thousands for a week on a boat, an extra 20 per cent commission is a bit rough. Even Beyoncé likes a bargain. Or her accountant, anyway. Later this year, Malouf plans to sell Mischief in Monaco. So then what, an upgrade?